It’s getting to that really busy time of year where time might be short for reading a full length novel. So here’s a solution if you fancy a festive read but don’t have much time to spare. 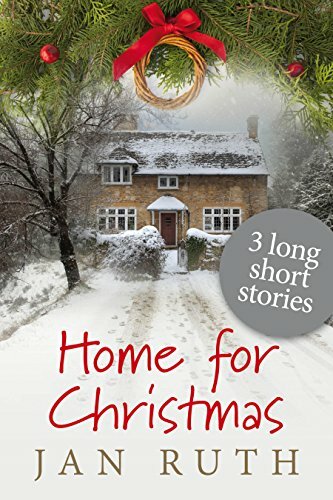 Jan Ruth’s Home for Christmas comprises three long short stories, each of which could be read over a coffee break. The first story, Rudolph the Brown Nosed Reindeer, features Rick who is not looking forward to Christmas at all. His girlfriend Lynne has just left him, he’s having to go on a corporate away trip combining team-building with the Christmas lunch and he has to find a suitable Secret Santa for his PA Pauline who he has never actually met. Rick could give Scrooge a run for his money with his attitude to this particular weekend and Christmas in general. Despite him being a rather grumpy character there was something endearing about Rick. Like many men, he finds it difficult to articulate his feelings and this is what has led to the breakdown in his relationship. When he meets Pauline, he feels attracted to her but starts to wonder if he has made a big mistake letting Lynne go so easily. This was my favourite of the three stories as I was hoping that Rick would learn to say what he feels and find happiness. Jim’s Christmas Carol had a bit of a mystical theme. Jim has been having an affair with Carol, a free spirited tarot card reader. He wasn’t very likeable person and I felt sorry for his wife Kath. On Christmas Day, Jim is rather surprised by two of the guests Kath has invited to join them. Kath’s sister Julie has also brought along her rather enigmatic boyfriend Clay. It was certainly an eventful Christmas Day with forces for good and evil at work. I liked the way the story ended with the suggestion that Jim was perhaps going to get what he deserved for cheating on his wife and generally being a bit of a slob! The final story features Phillipa (or Pip) who has returned to her home village only a few months after having left for the bright lights of London with her boyfriend. Unwilling to admit that things have gone wrong, she makes up some tall tales which get more outlandish in each telling. When she becomes involved in the local drama group, she discovers a talent for and a love of acting. There were some really funny scenes involving one of the other actors and a tea-trolley! Romance could also be on the cards for Pip with the arrival of a childhood friend but the last she heard he was married with twins. And can she admit that she has been lying all along? Not your typical Christmas stories with romance and snow and everyone living happily ever after, these stories offer perhaps a more realistic view of Christmas. The Snowdonia setting was incorporated into the stories with great effect adding to the festive atmosphere. Although short stories, there is plenty of detail with a few unexpected twists in each to make them a satisfying read. Rick isn’t looking forward to his lonely corporate Christmas, but it’s the season of goodwill and magic is in the air. An off-beat love story. It’s time Rick wore his heart on his sleeve, or is it too late? Lessons in love from an unlikely source.